The Amber Valley offers many excellent places to eat, from small cafes and village pubs, to a la carte restaurants and hotels. Choose from a diverse range of international cuisines including Indian, Cantonese, Chinese, Italian and traditional British foods including award winning fish and chips. Many venues continually win both National and Local competitions for excellence, including the Derbyshire Quality in Food and Drink Awards. Many restaurants are increasingly using locally sourced produce in their restaurants giving a real flavour of the region. 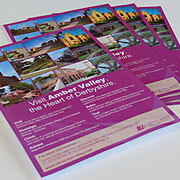 More information on where to eat out in Amber Valley can be found in our Eating Out Guide.